He who is never despondent .om a-nirviNNAya namah.SrI satyadevo vAsishTha derives the meaning starting from the root vid -vicAraNe to discuss, to consider. SrI BhaTTar explains this by indicatingthat bhagavAn does not become despondent even though His expectations thatwe will resort to Him for our redemption are not fulfilled. He just goes onwith a new creation in the hope that we will meet His expectations in ournext chance. SrI v.v.rAmAnujan refers us to nammAzhvAr - SOmbAduip-palluruvai ellAm paDarvitta vittA - periya tiruvantAdi 18. SrI Sa~nkaragives the interpretation that He is never despondent because He has nowishes that are not fulfilled.The term a-nirvedah is also used to explain this nAma - One who is notdespondent or in despair.The dharma cakram writer points out that just as the heart ceaselessly keepsbeating in order to keep us alive but takes rest constantly in between thebeats and so never gets tired, bhagavAn ceaselessly creates this world andrests also continuously in between and never gets tired. If we do ourkarma-s with a sattvic attitude we also will never get despondent, but if wedo our karma-s either with the rAjasic or tAmasic disposition, we will geteasily depressed. This is the lesson we should take from this nAma. He who is Immense.Om stahvishThAya namah.The author of nirukti explains this nAma as "sthoulyAt sthavishThah. SthUlameans large, immense, huge. SrI BhaTTar explains this sthoulya in terms ofthe huge grouping of stars referred to SiSumAra in vishNu purANa 2.9.1 -tArA-mayam bhagavatah SiSumArAkRtih prabhoh - The form of the mighty Hariwhich is present in heaven, consisting of the constellations, is that of aporpoise, with dhruva situated in the tail, etc. SrI v.v.rAmAnujan observesthat this constellation is revolving constantly like a cakra, and is beingconstantly drenched by the Ganges flowing from the satya loka to this earth,and is a reminder that bhagavAn is constantly striving to rejuvenate andsustain the beings of this Universe. SrI rAdhAkRshNa Sastri givesreference to taitttirIya AraNyaka 2.19, which also describes bhagavAn inthis great form of SiSumAra, the Gangetic porpoise, with all the deva-s aspart of His body - tasmai namas-tac-chiro dharmo mUrdhAnam brahmottarAvishNur-hRdayam.....sa vA esha divyah SAkvarah SiSumArah. SrI Sastri alsorefers us to the description of the huge form of bhagavAn in SrImadbhAgavatam, 2.1.24 - 2.1.38, starting with viSeshas-tasya deho'yamsthavishThaSca sthavIyasAm. Here He is described as sthUlasyAm sthUlah -the most huge among those that are huge (Slokam 24), and sthavishThe vapushi(Slokam 38) - He with the form that is huge.SrI Sa~nkara gives reference to another vedic passage - agnir-mUrdhAcakshushI candra-sUryau - muNDakopanishad 2.1.4 - Agni is His head, the moonand sun are His eyes. The All-supporter.om bhuve namah.bhu bhav - to be - He who exists, without any other support. Thus oneinterpretation is that this refers to One who truly exists, unlike all otherbeings which have only temporary existence in a bodily form.bhu also refers to Earth, or in this case the support for all the stars inSiSumAra referred to in the previous nAma. The vishNu purANa passage quotedin the previous paragraph says that dhruva is in the tail of the SiSumAragroup of stars, and as dhruva spins, all the other stars spin with it, andis thus the supporter of the SiSumAra constellation. Since dhruva is a formof bhagavAn, bhagavAn is thus the supporter of all the stars of SiSumAra.This is SrI BhaTTar's vyAkhyAnam. SrI rAmAnujan refers to nammAzhvAr -tiRambAmal maN kAkkinREn yAnE (tiruvAimozhi 5.6.5), and to tirumazhiSaiAzhvAr - nAgamEndu maNNinai...kAttu (tiruccandaviruttam 6) - He who supportsthe AdiSesha who supports the Earth.SrI Sa~nkara uses an alternate pATham as his primary text here, leading tothe nAma as a-bhuh- He who is not born, though he also refers to thepossible alternate pATham - bhuh, Existence. He who is united with dharma.om dharma-yUpAya namah.yu - miSraNe to join. yUpa refers to a post, e.g., the sacrificial post towhich sacrificial animal is tied. Here it refers to His being the peg forall dharma-s.SrI BhaTTar's vyAkhyAnam is - dharma-tattvam Sirah avayavatayA yauti itidharma-yUpah - He in whom dharma is united as part of His body viz. head.The taittirIya AraNyakam passage referred to in nAma 437 starts with "tasmainamas-tac-chiro dharmah" - He whose Head is dharma. SrI BhaTTar quotes"dharmo mUrdhanam ASritah - dharma has resorted to His head". dharma isHis most important responsibility (v.n.vedAnta deSikan).SrI satyadevo vAsishTha gives a different anubhavam of this nAma. dharma isthat which sustains - dhArayati iti dharmah. yUpa as was pointed outearlier is derived from yu - miSraNe to join. The pa~nca bhUta-s serve thepurpose of sustaining life in this world. Since bhagavAn unites the pa~ncabhUta-s which sustain the life in this world, He is dharma-yUpah.The dharma cakram writer observes that dharma and bhagavAn are not distinct.This nAma should remind us that those who follow dharma are always protectedby bhagavAn. This was the advice given to duryodhana by bhIshma whenbhIshma had to fight on the side of duryodhana, viz. that there is no waythat the pANDava-s can be defeated because they are on the side of dharma. The Great ya~jna-svarUpi.om mahA-makhAya namah.makhah refers to yaj~na, sacrifice, or sacrificial oblation. SrIv.v.rAmAnujan points out that bhagavAn is ya~jna-svarUpan. This can bebest understood from SrI satyadevo vAsishTha's explanation that ya~jna issomething that gives whatever is desired on successful completion.BhagavAn is the mahA-makhah since He bestows everything desired on Hisdevotees. The Universe and all the things He has created for the enjoymentand benefit of the beings of this Universe are examples of things thatresulted from this 'mahA-mahkah'.Another explanation is that dharma is the greatest ya~jna (ya~jno dharmaScavi~jneyah), and since dharma is His head, He is Himself the great sacrificepersonified (mahA-makhah).SrI Sa~nkara bhAshyam is that He is mahA-makhah (The Great sacrificialoblation?) because sacrifices or offerings to bhagavAn lead to moksha, thegreatest of the benefits. He who makes the stars move.om nakshatra-nemaye namah.SrI satyadevo vAsishTha gives the derivation for nakshatra as "na ksharatikshIyate vA". The word nemih is derived from the root nI to lead or carry.SrI BhaTTar vyAkhyAnam is "jyotiS-cakram nayati iti nakshatra-nemih". Herefers to the continuation of the vishNu purANam passage referred to in nAma438. "evam bhraman bhrAmayati candrAdityakAn grahAn | bhramantamanu tam yAnti nakshatrANi ca cakravat ||* vishNu purANam 2.9.2. "As He (in the form of dhruva) goes round, He makes the sun, the moon andother planets revolve. All the stars also follow Him like a wheel as Hemoves in a circle".VishNu purANam continues with "SiSumArAkRti proktam yad-rUpam jyotishAm divi | nArAyaNah param dhAmnAm tasyAdhArah svayam hRdi || (2.9.4) "The porpoise-like figure of the celestial sphere is upheld bynArAyaNa, who Himself, in planetary radiance, is seated in its heart".Reference to vishNu being in the heart or center of the SiSumAra cakra andbeing responsible for its movement is also made in the the svAdhyAyabrAhmaNa of taittirIya Sakha referred to under nAma 437. SrI Sa~nkara usesthis reference to explain that bhagavAn is nakshatra-nemih because He is inthe center of the SiSumAra collection of stars, and is the one who supportsit like a nave at the center of the wheel.The dharma cakram writer reminds us how important this function of mahAvishNu is. If only one of the millions of stars goes out of its pathprescribed by Him, the consequences will be disastrous for us. This nAmashould remind us that just as order in the macro level is important for oursurvival, there is need for order at the thought level as well for thelong-term survival of all of us. If the thoughts are not good, and if theyare not devoted to the welfare of the world as a whole but areself-centered, the consequence is the long-term destruction of the whole. He who has (supports) the stars.om nakshatriNe namah.SrI satyadevo vAsishTha explains that just as one who has kshetra is calleda kshetri, or one who has SarIra is called a SarIri, one who has the starsis nakshatrI. SrI BhaTTar explains that His being the Lord and drivingforce behind SiSumAra is the reference here. SrI Sa~nkara gives theinterpretation that nakshatrI refers to His being the Moon, the Lord of allthe stars (nakshatrANAm aham SaSI - Among the stars, I am the Moon - gItA10.21). a) He who is competent.b) He who has great patience.om kshamAya namah.a) This interpretation is based on ksham - sahane to allow, to suffer. SrIBhaTTar's vyAkhyAnam is - akhila bhuvana bhAram anAyAsena kshamate - vahatiiti kshamah; He is known as kshamah because He bears the burden of theentire Universe with ease. SrI Sa~nkara bhAshyam is "sarva kAryeshusamarthah kshamah - He who is clever and competent in everything.b) SrI Sa~nkara gives an additional interpretation based on ksham - sahaneto endure. He refers to SrImad rAmAyaNa - kshamayA pRthivI samah - SrIrAma is like the earth in patience - bAla kANDa 1.18.The dharma cakram writer links the two interpretations nicely by pointingout that in order to be competent and efficient, you have to act withpatience. And when we act with patience and thus become efficient in ouracts, the feeling we should have is that this is the kRpA of bhagavAn.This nAma conveys the idea that in order to be efficient and proficient, weneed to be patient and then dedicate the results of this efficientperformance to bhagavAn and grow our devotion to Him. This in turn will getus closer to realization of Him.SrI satyadevo vAsishTha points out that when the jIva-s leave the vedic pathand pursue other paths, He does not lose His patience, but instead gives thefruits that are consistent with these actions and thus makes them pure andkeeps giving them more opportunities to correct themselves. In a sense,bhagavAn's guNa of kshamA is reflected in everything in this Universeinherently. The individual soul puts up with the body for the duration thatis prescribed for it irrespective of all the actions of the body, everycreation of His puts up with the heat and cold to which they are exposed,etc. a) He who is in a diminished form.b) He in whom all forms diminish.om kshAmAya namah.The root from which this nAma is derived is kshau - kshaye to waste. SrIBhaTTar explains this nAma by pointing out that bhagavAn stands in the formof dhruva in a diminished form at the time of the dissolution of the Earthinclusive of the five elements. All the luminaries up to dhruva disappear,and dhruva alone remains shining in his place, as stated in vishNu purANa - "yAvan-mAtre pradeSe tu maitreyAvasthito dhruvah | kshayamAyAti tAvat-tu bhumerAbhUtasamplave || 2.8.92SrI Sa~nkara's vyAkhyAnam is that He is kshAmah - The Remainder, since Healone remains when everything else has disappeared in pralaya.SrI satyadevo vAsishTha gives the explanation that bhagavAn is kshAmahbecause He is hidden in everything in this Universe. a) He who establishes all others (indra etc.) in their respective posts.b) Well-wisher - He who works towards the welfare of His creation.om samIhanAya namah.The nAma is derived from the root Iha ceshTAyAm - to aim at, to desire, tostrive for. There are two aspects to striving for something. One is tostrive by oneself, and the other is to make others work. Thus there are twodifferent interpretations given for this nAma.SrI BhaTTar's vyAkhyAnam is that bhagavAn after the deluge, at the time ofcreation, makes all the other deva-s do their work in their respectiveposts. samIhayati iti samIhanah. 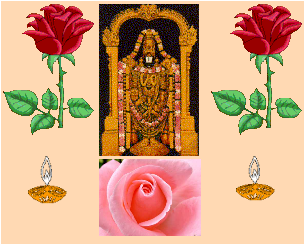 SrI v.v.rAmAnujan gives reference totivuvaImozhi - iRukkum iRai iRuttuNNa ev-vulagukkum tan mUrti niRuttinAndeiva~ngaLaga ad-deiva nAyakan tAnE (5.2.8).SrI Sa~nkara's vyAkhyAnam is that He is one who wishes well for His creation- SRtyAdi artham samyagIhata iti samIhanah - Well-wisher.SrI satyadevo vAsishTha gives several references from Sruti-s to support theinterpretation of this nAma, among which is the following from Rg veda - "sUryA-candram-asau dhAtA yathA pUrva-akalpayat | divam ca pRthvIm ca antariksham atho svah ||- Rg 10.190.3.